In this blog post we discuss EOS BittsBands. 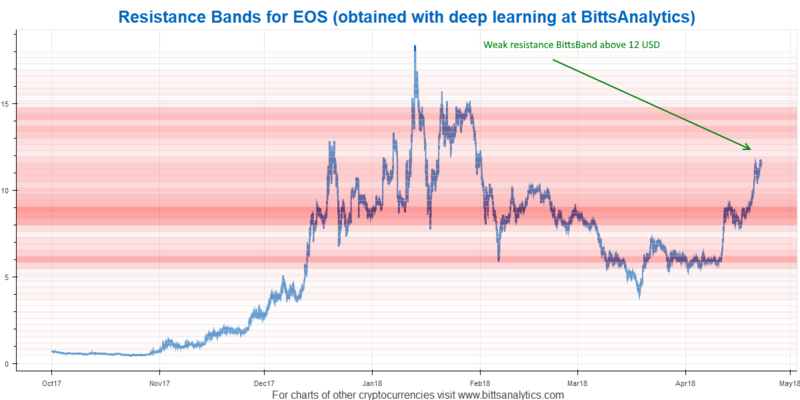 As you can see in the BittsBands chart below EOS was approaching prices ranges with very weak BittsBands above 12 USD. That means a high probability of rapid rise of EOS and this is indeed what happened next with the price now over 15 USD for a quick 25% return in around a day. If you want to include these deep learned analysis in your cryptocurrency trading you can find it at our BittsAnalytics platform: www.bittsanalytics.com.. Platform also has a lot of other advanced data such as social media analytics and chart patterns automatically detected with AI as well as sophisticated analytical tools.